Playing off the interest in creating software defined networks for virtualized environments, startup ConteXtream has launched a product that allows a data center operator to separate network services such as firewalls and load balancers from the physical hardware. The company, which was formed in 2006, is backed by Benhamou Global Ventures, Gemini Israel Funds, Norwest Venture Partners and Sofinnova Ventures as well as Comcast Interactive Capital (s cmcsk) and Verizon Investments (s vz). ConteXtream’s new product helps create a virtualized networking environment in the cloud by adding software to a server running at the top of a rack. Joel Brand, VP of Marketing of ConteXtream, argues that virtualizing a rack of servers in a distributed fashion has two advantages over the competition. 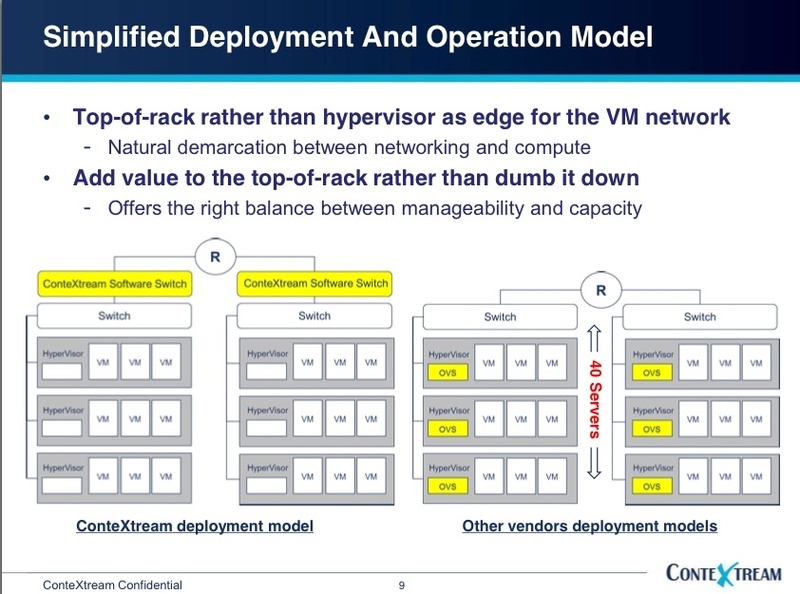 Brand notes that ConteXtream’s software creates fewer nodes to manage unlike virtualizing a network at the hypervisor level, such as VMware’s (s vmw) VXLAN does. 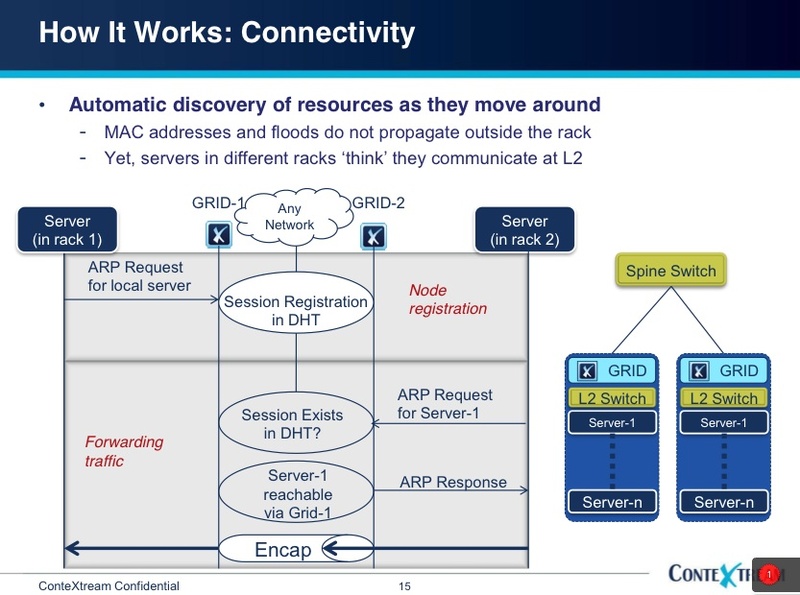 For companies such as Big Switch and Nicira, which are building software-based network controllers, Brand says the ConteXtream option is distributed enough that if one element fails, it doesn’t take down the entire network — just an entire rack. Brand didn’t call it the Goldilock’s approach, but that’s essentially the argument here. However, given the different types of cloud and webscale environments, it will be up to the client to decide what their tradeoffs are in taking this middling approach. Another aspect of the software, which is worth mentioning, is that when it is deployed on servers, the software at each machine keeps a full record of all the policies and restrictions placed on the network as a whole. ConteXtream’s release of this software, coming on the heels of Embrane’s software launch, and more and more activity in the software defined networking space leads me to expect that after a few years of talking about Open Flow and a bit about network virtualization — the idea of software defined networking will begin moving from vaporware to virtualizing actual machines.